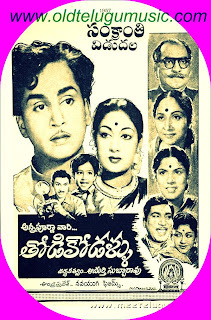 Thodi Kodallu is a 1957 Telugu film directed by Adurthi Subba Rao and produced by Dukkipati Madhusudhana Rao of Annapoorna Pictures. The story is adopted from Nishkruti novel of Saratchandra Chatterjee excellently adopted to the Telugu audience. Kaarulo Shikarukelle and Aaduthu Paaduthu Panichestuntu songs are memorable hits in the film.